More detailed explanations can be found in the Ascendo DataVault for BlackBerry & Windows User Guide. - How do I download and install DataVault for Windows desktop? - What should I do if I see the error message "No additional applications designed for your device were found."? - What should I do if I see the error message "No Applications were found for your device."? - Can I run the DataVault Desktop on an Mac? - Is there an iPhone version of Ascendo DataVault? - My trial period expired before I was able to spend sufficient time testing. Is it possible to have the trial extended? - When I purchased DataVault, I entered the wrong PIN number and the registration key I received does not work. What should I do? For Versions 4.5.3, type http://tinyurl.com/n7azbm and click on the Return Key. Then follow the prompts to download, install and run the "DataVault Loader". This utility will detect the version of your BlackBerry OS and load the best version of Ascendo DataVault for your handset. If the DataVault Loader does not appear after installation, close the BlackBerry Browser and/or restart the DataVault Loader from the BlackBerry home screen or Download directory. - For Version 4.5.3, click here. Extract the files in the Ascendo DataVault ZIP file using Windows Vista, 7Zip, Winzip or a similar utility. Browse to the "/BlackBerry" directory of the folder you specified when you extracted the Ascendo DataVault ZIP file. Select the Ascendo DataVault ALX file and follow the prompts. 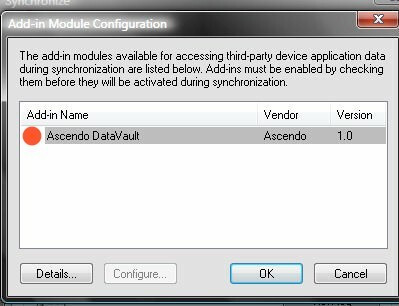 To manage information on your PC and synchronize with your BlackBerry, you will need to download and install the Ascendo DataVault Desktop, see above. Question: How do I download and install DataVault for Windows desktop? Answer: Please note, the version of DataVault for Windows found below can only be unlocked with a registration key for the "DataVault for BlackBerry & Windows" bundle. If you do not plan to use DataVault for Windows to synchronize with DataVault for BlackBerry, please click here for installation instructions. To install DataVault for Windows desktop for use with DataVault for BlackBerry, follow the steps below. - For Version 4.5.3 click here. Start the Windows File Explorer. Browse to the "/Desktop" directory of the folder you specified when you extracted the Ascendo DataVault ZIP file. Double-click on the DataVaultSetup.exe file and follow the prompts. Question: Can I run the DataVault Desktop on a Mac? Answer: We are currently beta testing DataVault for Mac OS and expect to launch in a few weeks. The initial version will synchronize with DataVault for iPhone, iPod Touch & iPad. Subsequent releases will synchronize with DataVault for BlackBerry. The beta program is currently limited to customers of DataVault for iPhone, iPod Touch & iPad. If you are interested in participating, please email info@ascendo-inc.com and include "DataVault Mac Beta" in the subject. Question: Is there an iPhone version of Ascendo DataVault? Answer: Yes, Ascendo DataVault for iPhone is available from iTunes. For more information, click here. It is very important that you read the the answers below carefully and follow the instructions to receive a registration key.